I see a lot of Musical theater. On average between professional, college, high school, and community theater shows I see approximately six shows a month. This means I see theater that is great, and theater that is not so great. I love theater, I love to be a part of shows, and I love to be a part of the audience of shows. Theater is a religious experience for me, tightly connected in my spirit as an unadulterated form for interaction with the divine. Stephen Sondheim wrote, "Music is mysterious and I think it’s as necessary to human life as breathing." For me I would take his illusion farther to state that if music is air, than a script is food; it can be be organic and healthy or sugary crap but either way it is meant to be ingested and digested. One would think in the midst of all this praise for musical theater, that I would sit in shows and be blown away by the story, the music, the production with great regularity. This is not the case. In fact, I have been left breathless by theater only four times that I can remember. My first story takes me back to a ten year old boy seeing, "Who Can Paint The Dragon's Wagon" performed by a community theater troupe, in an NCO club in Ramstein Germany. This is my first experience with musical theater, and I was enraptured by the entire experience that a story could be brought to light this intimately My second mountaintop, was the first time I saw Lion King at the Fox Theater here in St. Louis, if you have seen Lion King you understand, if you have not, it can not be described. Third in this journey through my most euphoric theater experiences is a performance of "Children of Eden" in a small Black Box theater in Chicago; I have never been in a room other than that evening where the lights came up for intermission and the entire audience was so engaged by the show that everyone sat in reverence for what they had just experienced for several minutes before the room began to stir. The fourth and final summit of this story takes place about seven years ago when I saw Wicked for the first time. Defying Gravity as the Act 1 conclusion is pure theater magic, and since seeing that number, in that show, that evening nothing else has blown me away. That is to say, in those past seven years nothing has blown me away before this past Saturday night. Saturday night I traveled to a small theater to serve as an usher for New Line Theater. I have never seen a New Line show before, and was only there at all because I have a buddy who is the sound designer and as I stated before, I love musical theater. I was here to enjoy a show, as I have enjoyed many many other shows through out these years. I had no idea I was walking into a sacred space that would one again recapture my spirit, rekindle the search for beauty, and most importantly show me I had not previously been to the summit but instead had only walked a lofty escarpment leading to another peak. This peak was so magical because it perfectly brought my wonderment of the previous peaks into perfect harmonization. "Fairy tales, then, are not responsible for producing in children fear, or any of the shapes of fear;fairy tales do not give the child the idea of the evil or the ugly; that is in the child already, because it is in the world already. Fairy tales do not give the child his first idea of bogey. What fairy tales give the child is his first clear idea of the possible defeat of bogey. The baby has known the dragon intimately ever since he had an imagination. What the fairy tale provides for him is a St. George to kill the dragon." This is the zen we are all searching for, something close enough to normal to get by. We all know there are dragons, monsters, and creatures that frighten us from within in the deepest most lonely hours of nighttime's darkness. Next to Normal, moves into that intimate space of our own imagination and reminds us that the weapons against these monsters are closer than it seems. 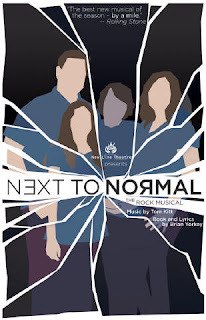 Scott Miller directs New Line theater's production of Brian Yorkey's and Tom Kitt's masterpiece "Next To Normal." In his production he encapsulates everything perfect about live musical theater. Pulled into the dysfunction of the family so perfectly, you feel as if there needs to be an empty seat at the dinner table for you. A set that is fairly minimalist and yet is disconcerting and haunting by itself, before a single actor has walked on stage sets the audience off kilter and prepares them to enter the world of the story dysfunction. His characters are priestly in the way they become arbiters between the physical and metaphysical crag the story treacherously sets as it's path. The experience perfectly completes the circuit between stage and audience. Without ever physically breaking the fourth wall the story's metaphors completely obliterates the safety and comfort the fourth wall provides the audience's perspective. There is no better description for this show than to refer to it as sacramental. No matter which character's dysfunction we find ourselves illustrated by the lesson of the show is that, there is grace, and that grace is sanctifying. Perhaps it is put better in the show's own words, "When our long night is done, There will be light."